The Real e-Learning online learning platform, Campus Online 3, has been developed by our in-house educational psychologists and learning technology team over the past decade. The platform has been refined over time, with the most recent iteration going live in autumn 2012. The platform is robust and reliable, currently supporting dozens of different training courses and thousands of users. New updates, features and fixes are released every two weeks ensuring that the platform remains up-to-date and secure. 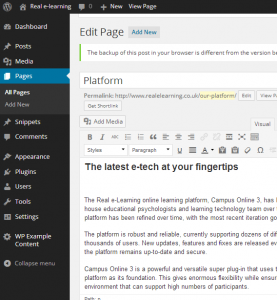 Campus Online 3 is a powerful and versatile super plug-in that uses the WordPress publishing platform as its foundation. This gives enormous flexibility while ensuring a robust and secure environment that can support high numbers of participants. The user administration system can be tailored to your needs, including customised front-end sign-up. The system includes a range of use progress reports, and we can add custom reports to the system as required. Campus Online 3 can also be configured as a multi-site learning environment. This allows administrators to choose which e-learning courses and elements the learner will have to complete. The user interface of Campus Online 3 can be fully customised and re-branded to fit your design guidelines. The theme management system allows every element of the system to be styled, and child themes and multi-site settings can rebrand the materials for different client groups. Prepared learning materials can be embedded directly into the course including documents, video, audio and animation. Basing Campus Online 3 on the WordPress publishing platform allows courses to be administered in more than 70 languages. Combining this with content purposed for multiple languages allows your course to be available in the language of your choice or even multiple languages. Campus Online 3 is integral to the success of our own suite of highly-successful distance learning courses. We are constantly improving the system and improving the functionality and user experience and will continue to do so. In addition the underlying WordPress platform is also being actively developed by a dedicated team of highly-skilled professionals as it now powers more than 20% of the Internet. All in all, you can be sure your course will stay at the cutting edge. Accessibility is critical to ensuring courses are fit for purpose, and we aim to be triple-A compliant with any materials that we produce. Our technical team understands current standards and makes sure the templates and courses meet the above criteria and are Disability Discrimination Act compliant.